In the last year and a half, Democratic presidential hopeful Senator Barack Obama has faced a myriad of attacks against his personality, character and background. It’s not that presidential politics in the United States is getting any meaner or worse than before. It’s that Barack Hussein Obama, the son of a white mother from Kansas and an African father from Kenya, provides a more colorful smorgasbord of topics for the misinformation machine. During the Democratic primary campaign, one Hillary Clinton volunteer was fired for disseminating an e-mail about Obama being a Muslim. Another Clinton campaign surrogate forwarded to the media a picture of Obama from his visit to Africa, in which he was wearing traditional garb, as many leaders tend to do. The Clinton campaign never admitted or denied that it sent the photo, instead tried to spin the story by saying that “Obama shouldn’t be ashamed of wearing traditional Somali clothing.” Fortunately for Senator Obama, these campaign tactics did not work and he managed to clinch his party’s nomination. Unfortunately, the hate mail campaign against him continues on the Internet, with chain e-mails circulating all sorts of lies about who he is and what his beliefs are. What’s curious about some Americans’ continued interest in letting the whole world know “who the real Barack Obama is” is that this is a candidate who has been particularly open about who he is and how he found himself. Obama is a prolific writer, and Dreams from My Father, his 400-plus-page autobiography, which he penned when he was 33, reveals more about him than what would be comfortable for most national politicians. Despite it being a bestseller, apparently there are still people out there who have more to learn about this “skinny man with a funny name.” Good news for those who don’t want to trudge through the first 300 pages of that book before getting to the last 150 about Kenya, there is a new film that gives a glimpse of the candidate in his ancestral home. Senator Obama Goes to Africa, directed by Bob Hercules, is a concise and balanced documentary chronicling Obama’s diplomatic trip to Africa in 2006. In 60 minutes, the film takes the viewer from Obama’s father’s country of birth, Kenya, to South Africa and finally to eastern Chad, to a Darfur refugee camp. Obama narrates the documentary (which might give the naysayers an easy reason to question its objectivity) but the senator is quick to point out this trip is “obviously a big production.” He’s followed not only by the filmmakers but also by international news media everywhere he goes. Even under these extremely public circumstances, Senator Obama Goes to Africa is a film that manages to capture candid moments of the presidential candidate, his family and fans on the other side of the world. 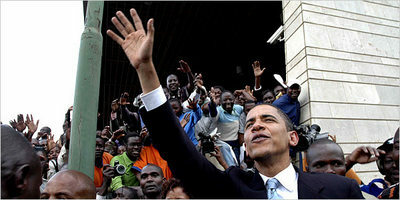 In Nairobi, Kenya, Obama admits some people in Africa, as well as in other parts of the world, can tend to have unrealistic expectations of what the United States as a government or its individual citizens can do for them. He says wistfully, “It’s not like I have bunch of wads of cash in my pocket to give out.” His sister Auma Obama puts his sentiments in context with an observation about their father: “He (Obama Sr.) had so much pressure, so many expectations to live up to… he was just one person trying to look after hundreds.” Senator Obama speaks more about his father at the University of Nairobi. He talks about how his father went from tending goats in Africa, to study in Hawaii and later on at Harvard, to return to Africa as a respected economist. But Obama also adds that his father’s ideas of how Kenya should progress eventually put him at odds with those in power, resulting in his firing from his government job and becoming unemployable. Obama tells the Nairobi University crowd that his family’s life “reflects the contradictions of Africa.” The accomplishments are impressive, but there is still an unfulfilled potential. He then makes a call against government corruption, deeming it a “crisis that’s robbing honest people from opportunity.” Ellis Cose, a contributing editor for Newsweek, describes Obama’s speech as “somewhat calculated.” “He knew it would play well to the local crowd and establish his credibility,” Cose says. But for Obama, it was important to “echo some of his (Obama Sr.) thoughts.” He’s a very public figure, but remains also a son who continues his efforts to redeem his father’s legacy. In Kisumu, Kenya, his father’s hometown, thousands gather in the streets to welcome him. Obama is somewhat surprised. “It’s much bigger than I expected,” he says. “I didn’t realize the degree to which my election in the U.S. prompted that much interest.” His sister Auma concurs: “In Kisumu, I expected the crowd, but I didn’t expect the attention to be that great nationally. He’s on the national TV more than the president at the moment, which is amazing.” The sights of Obama in Africa are comparable to only one previous guest at this continent. Anyone who’s seen coverage of “The Rumble of the Jungle” from 1974 will remember the great exuberance with which Muhammad Ali was received in Kinshasa, Congo. Obama’s crowds are even larger than that of Ali’s. In South Africa, Obama gets a similar welcome and he continues with his focus on health policy. Despite the request from a young woman, he doesn’t call for the dismissal of the health minister, saying, “it’s not my place to tell other governments what to do,” but he does tell the press that the information distributed by the ministry is not accurate. He calls the prescription of garlic, beetroot and lemon for HIV “troubling,” and says it isn’t a case of Western science vs. African science. “It’s just not science.” Once again, the health workers and HIV/AIDS activists are thrilled. “He’s right,” Zackie Achmat says. “We wish more people could speak honestly like that.” Again, Cose from Newsweek, claims that Obama “had to say this if he was going to be credible,” however, Achmat points out that there are plenty of public figures out there such as Kofi Annan and Tony Blair, who have yet to say the obvious when it comes to health policy in South Africa.